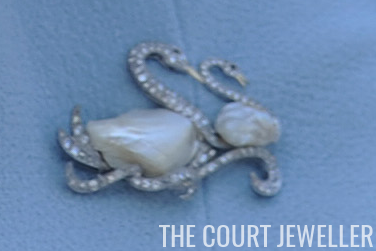 As we wrap up our nine days' historical journey through the Queen's jewelry collection, it's time to look at some of the newest additions to the royal vaults. 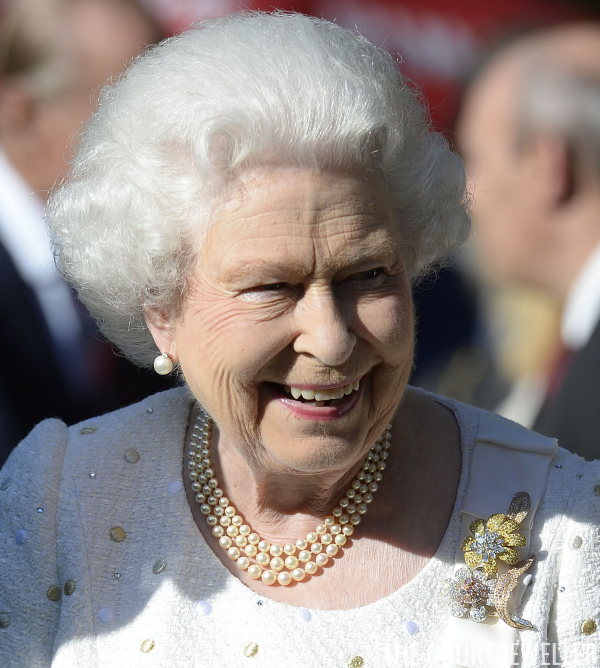 Here are ten brooches that have been given to the Queen over the past decade, many of them to celebrate her Diamond Jubilee and the 60th anniversary of her coronation. 81. 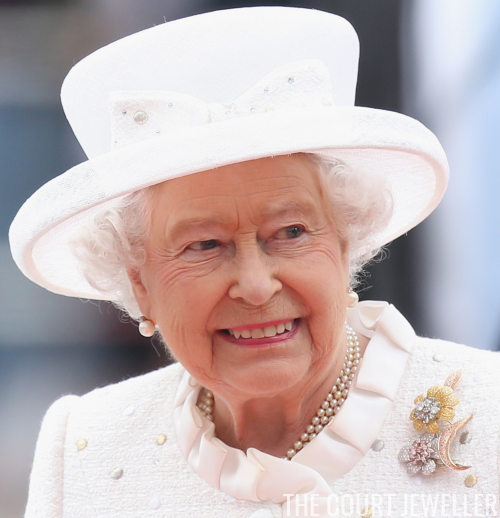 The Botswana Sorghum Brooch: This glittering diamond and gold brooch was given to the Queen in 2007 by the President of Botswana; she debuted it during the 2014 French state visit. Sorghum is a staple agricultural product in Botswana, which is a member nation of the Commonwealth. 82. The Tudor Rose Brooch: The exact provenance of this brooch isn't known, although some suspect that it was part of a set of brooches gifted to the Queen in 2012 by the Sultan of Oman. The diamond, ruby, and amethyst brooch features a Tudor rose set in a diamond vase. 83. 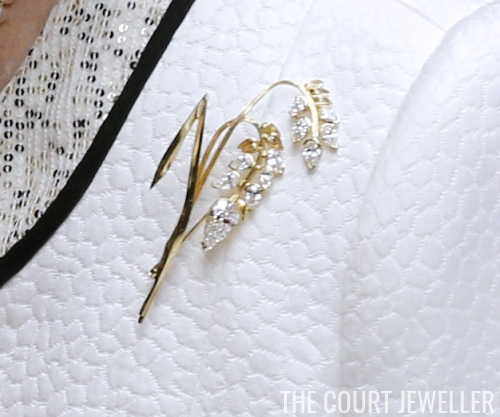 The Singapore Bird of Paradise Brooch: This intricate diamond and gold brooch was given to the Queen by the President of Singapore in 2012 as a Diamond Jubilee present. It was designed in traditional Peranakan style by Thomis Kwan, a Singapore-based jeweler. The piece features a "bird of paradise" motif. 84. The Mappin and Webb Orchid Brooch: This silver brooch was a gift to the Queen from Mappin and Webb, makers of jewelry and silver goods, to mark the 60th anniversary of the coronation in 2013. The piece was a collaboration between the firm and Waterford crystal; the brooch is made of gold and crystal studded with diamonds. 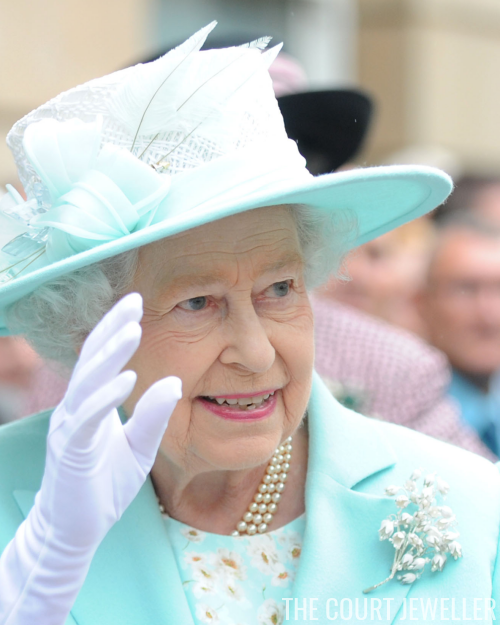 The Queen first wore the brooch during her landmark state visit to Ireland. 85. 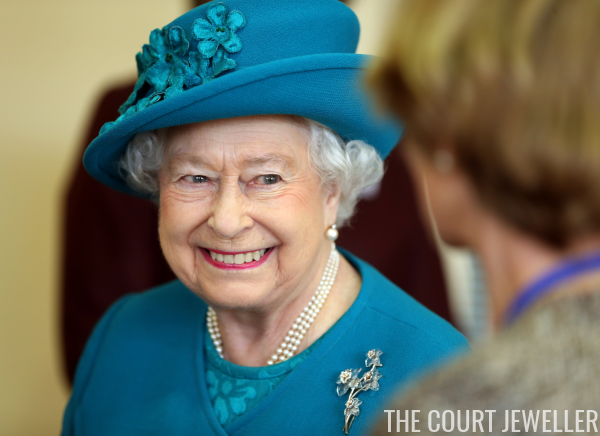 The Saskatchewan Tourmaline Brooch: In October 2013, the Lieutenant Governor of Saskatchewan presented the Queen with this modern brooch of diamonds, pink tourmalines, white gold, and a single pearl. The piece was made in Canada by Rachel Mielke for Hillberg and Berk, and the Queen reportedly gasped with delight when she saw it for the first time. 86. The Bronte Porcelain Brooch: The Queen debuted this new brooch during a 2014 visit to Northern Ireland. The brooch, which is shaped like snow drops, was designed by Bob and Lucy Price and manufactured by Bronte Porcelain. 87. 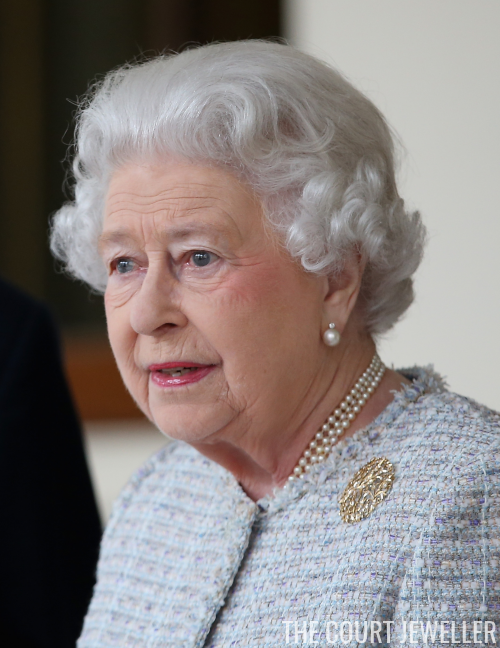 The Diamond Daffodil Brooch: This diamond daffodil-shaped brooch may have been another of the Queen's Diamond Jubilee gifts -- the provenance, however, has never been made public. Daffodils are an important symbol of Wales, so it seems appropriate that she first wore the brooch in a portrait painted for the Welsh Rugby Union. 88. 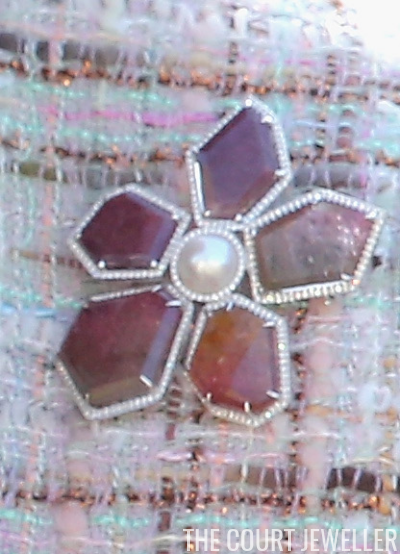 The Modern Floral Brooch: This is another new brooch with a mystery provenance. 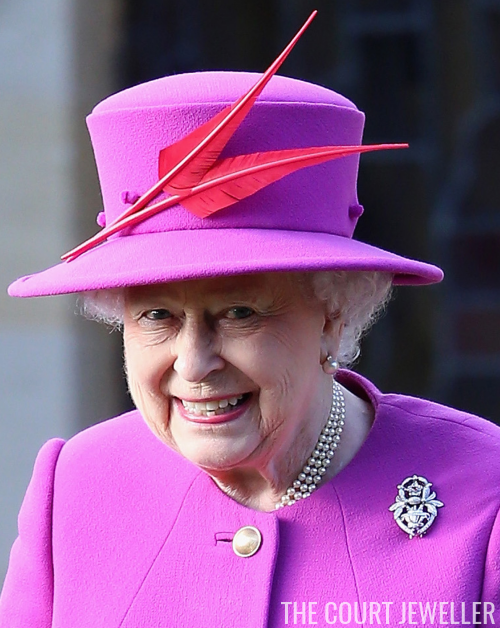 The Queen wore it in public for the first time during her 2014 French state visit; it features two flowers set with pink, yellow, and white diamonds. 89. The Two Swimming Swans Brooch: At Royal Ascot in 2014, the Queen debuted this charming brooch, which features two swans made of diamonds and pearls. The piece was made by Collins and Sons. 90. 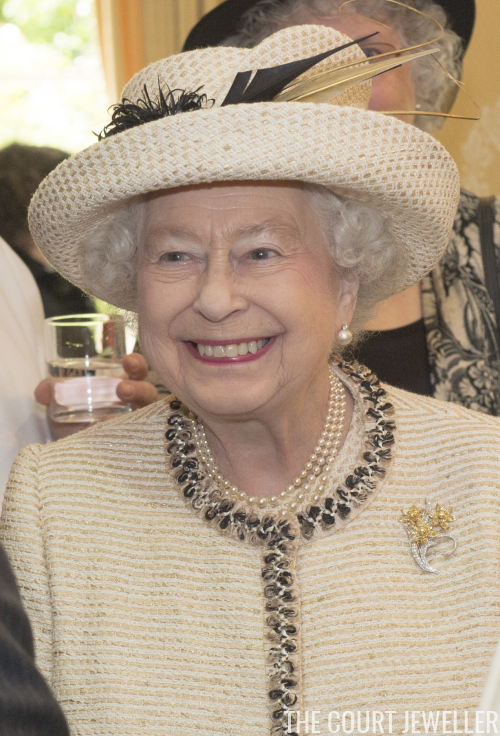 The FEI Horseshoe Brooch: Ever the keen horsewoman, the Queen was presented with this brooch of interlocking diamond horseshoes as a lifetime achievement award in 2014 by the International Federation of Equine Sports. Since then, she's worn it to receive the King and Queen of Tonga at Windsor Castle. Later today, stay tuned for a 90 Years, 90 Jewels Bonus Post!